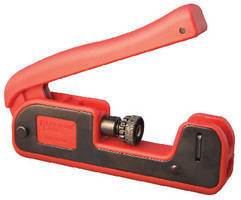 Compression Tool terminates F, BNC, and RCA connectors. Featuring universal head, SealSmart II Compression Tool, Model 16220C, is designed to work with all standard compression connectors available, including right-angle and RGB Mini. Tool supports coax cable sizes RG6 Quad, RG6, RG59, RGB/Mini, 59, 23, 24, and 25 AWG. It is suited for CCTV, digital satellite systems, CATV, residential and commercial structured wiring, security installations, and home theater. CAMARILLO, Calif., - Platinum Tools® (www.platinumtools.com), the leader in solutions for the preparation, installation and hand termination of wire and cable, is proud to announce that its new SealSmart II Compression Tool (model # 16220C) is now shipping. The SealSmart II Compression Tool has an MSRP of $27.95. "Our SealSmart II Compression Tool easily terminates F, BNC, and RCA connectors with a single tool...no need to switch adaptors," explained Lee Sachs, Platinum Tools, Inc. president and general manager. "The universal head is designed to work with all standard compression connectors available on the market, including right-angle and RGB mini." The SealSmart II Compression Tool is ideal for all CCTV, digital satellite systems, CATV, residential and commercial structured wiring, security installations, home theater, and for use with coax cable sizes RG6 Quad, RG6, RG59, RGB/Mini 59, 23, 24, and 25 AWG. "Its compact and lightweight design along with its fast and reliable terminations and quick and easily adjustable crimp height makes it the ideal tool for all installers," added Sachs. "The SealSmart II is always the right tool for compression connectors." For more information on the SealSmart II Compression Tool and Platinum Tools' complete product line, please visit www.platinumtools.com, call (800) 749-5783, or email info@platinumtools.com. All of our products must absolutely satisfy three critical benchmark criteria...utility of function; quality of function; and economic value. Our people are our company. They, too, must be focused on and work to satisfy multiple critical benchmark criteria...customer satisfaction; product knowledge and expertise; and willingness to learn and adapt.